Conferences offer invaluable opportunities for the scientific community to explore new areas of learning, share their research findings and network with their peers. It is not unusual for researchers to be called upon to organise a science conference or medical symposium and while the chance to engage with others working in their field can be welcome, the logistics of organising a large scientific meeting can seem a little daunting. 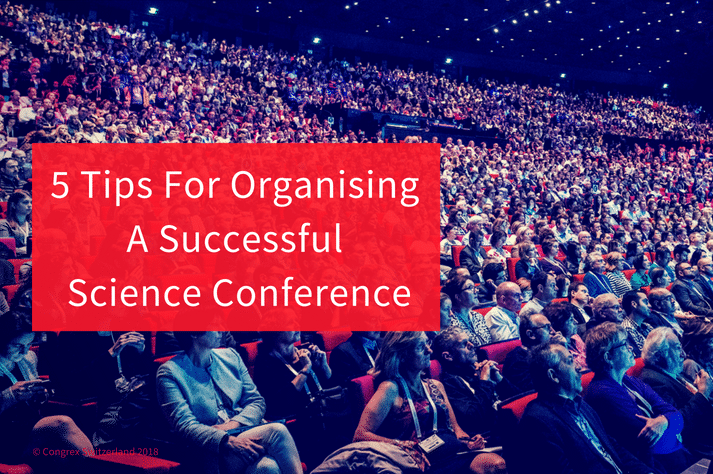 These tips should help you to rise to the challenge and ensure a successful scientific conference. The quality of the speakers and researchers and the material that they present is what will help your conference be remembered as a success. For your recruited and invited talks, aim for a balance of genders and include young researchers as well as senior scientists who are leaders in their field. You may wish to offer invited speakers some guidelines as to the material that should be covered in their talk. It’s also a good idea to have some backup speakers on standby in case of a cancellation. Consider bringing in local speakers whenever possible as you will not have to pay costly travel and hotel expenses and there will be no worries about cancellations due to missed flights. Scientists, doctors and researchers receive a large number of invitations to conferences, so you need to make your event more appealing than the competition. When planning a scientific conference that attracts international delegates, choosing a location that is easily accessible from around the world is vital. If the city offers additional cultural and historical interest, this will also help your event to stand out. Look out for a venue with excellent local transport links and one that is experienced in hosting the scientific community: you will need conference rooms of various sizes, rooms for interactive education and plenty of space for poster presentation. Deciding to attend a science conference is rarely going to be a last minute decision, so give attendees plenty of time by planning your meeting preferably at least twelve months ahead. It is well worth doing a little market research to discover whether participants prefer a conference held during the working week or over a long weekend, and also whether full or half days of talks are most practical for local attendees who may wish to fit in their talk or poster presentation around their regular working schedule. It’s a good idea to have fewer, more extended talks rather than more numerous, shorter ones as this allows time for plenty of ground to be covered without rushing. Allow for plenty of breaks: networking is one of the main benefits of a scientific conference and coffee breaks are the perfect opportunity to learn about others’ ideas and research. Consider having coffee stands in the poster presentation area to promote networking opportunities. Longer breaks are also invaluable, and optional cultural activities such as a tour of the city, a theatre trip or a sports event will provide a refreshing break from concentration on scientific matters. The conference sector is highly competitive, and it’s often difficult for scientists to take time off from their teaching or research programmes. To make your event more tempting, you need to prioritise high-quality opportunities for learning. Make sure that your attendees know the topics that will be covered, who will be giving the talks and what other learning opportunities will be available. There is no denying that it can be a real challenge to organise a science meeting so don’t be afraid to seek help and delegate wherever possible. Some institutions have their in-house meeting planning teams who can assist you with various aspects of organising your conference, from booking accommodation to securing local sponsors and funding. But if you want to be on the safe side, it is well worth employing the services of a professional conference organiser who can guide you through all of the pitfalls and ensure a successful science conference.